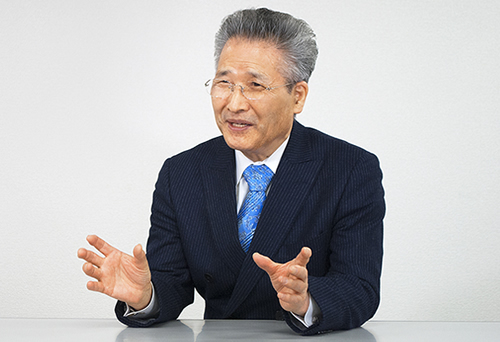 President's Message & Our Vision - About SunFlare - SunFlare Co., Ltd.
SunFlare exists to help realize the dreams of clients, employees and colleagues through the power of words. Ever since our establishment, we have sought to determine how words can best help our clients' achieve business success and how such words relate to IT. As a result of these efforts, we have concluded that the most desirable relationship with IT is one that brings out the full potential of people's creativity. 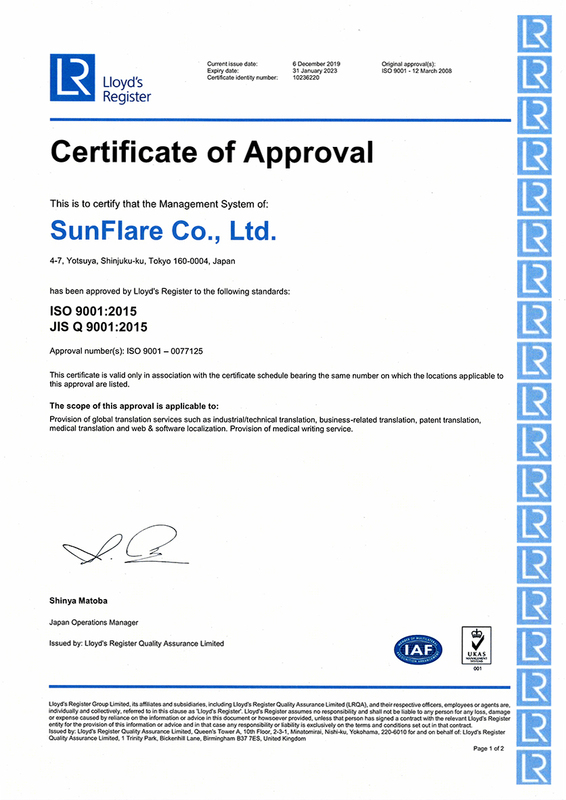 In 1981, we created two companies: SunFlare Academy, which provides a venue where individuals can train to be language professionals by leveraging their exceptional linguistic capabilities, expertise and practical business experience; and ANDROMETEC, a group company that develops IT tools aimed at supporting people's creativity. Our very existence came under threat when Black Monday struck on October 19, 1987. I quickly realized that the key responsibilities of any company include protecting its employees and colleagues and enhancing their level of happiness. To do that, a company obviously has to stay in business. Not only do we view our employees and colleagues as part of our family, but we also aim to continue playing an essential role in the lives of our clients. Dreams instigate curiosity and nurture creativity. Given this, we encourage our employees to take full advantage of their expertise with passionate enthusiasm and to help other members of our extended family shine like solar ﬂares, the inspiration for our company name. These are the sentiments that are interwoven into SunFlare's corporate philosophy of connecting the world with people, dreams and languages. The everlasting evolution of our reflective nature proves the relativity of human intellect. - Contribute to the advancement of society and human happiness in technological ﬁelds. - Contribute to the promotion of mutual understanding through translation. - Enhance our reputation for trust by ascertaining client needs to ensure that we always deliver high-quality services and products. - Build a creative company that uses its employees' expertise to its full potential. - Create an organization that cherishes its employees and colleagues and treats them as family. We will contribute to societal advancement and harmony by providing translation and documentation services in fields related to cutting-edge industrial technologies and culture. As experts in the translation and documentation business, we aim to remain an essential intellectual partner for our clients. We will respond appropriately to client needs and resolve issues with sincerity and passion. We will fulfill our responsibilities and respect each other's individuality with the aim of ensuring client satisfaction through optimal teamwork. As professionals, we will continue to strive for improvement by enhancing our expertise and technological knowledge. As well as providing a work environment that will enable employees and colleagues to reach their full potential, SunFlare will support their dreams and the happiness of their families. To inquire about our services or get a free quote, contact us by phone or via our online contact form. 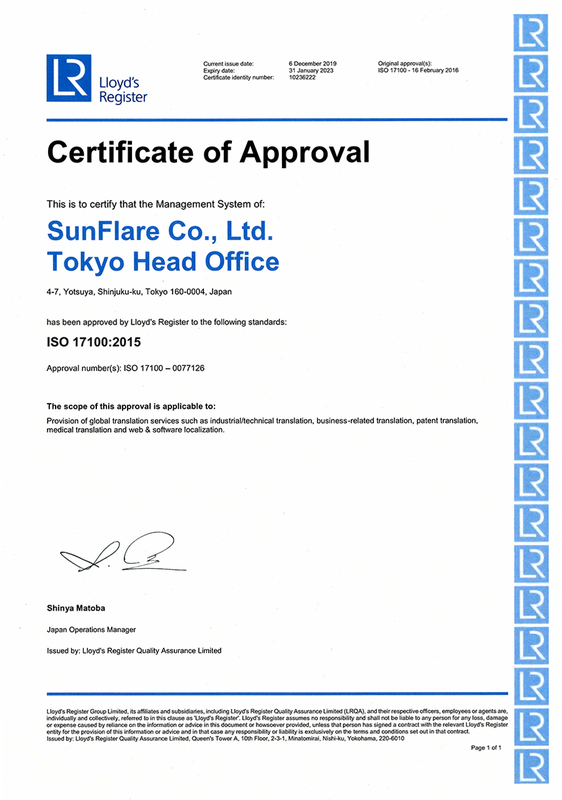 SunFlare has acquired four certifications. 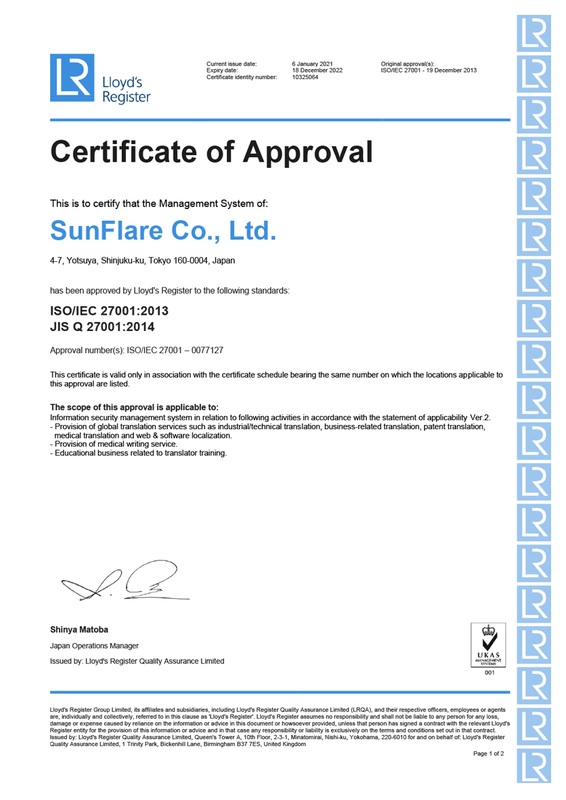 Click on the relevant logo for more information about a particular certificate. © 2019 SunFlare Co., Ltd. All Rights Reserved.